Suffering because of his father's departure to the big city, a boy leaves his village and discovers a fantastic world dominated by bug-engines and strange beings. An unusual animation with various artistic techniques that portrays the issues of the modern world through the eyes of a child. It almost feels as if Boy & The World was nominated for a best animated film Oscar simply to give the appearance that Pixar would have any chance of competition, but in reality it's quite a lovely film. It is a film as imaginative as its protagonist. Utilizing gorgeously simplistic animation to tell a beautiful, dialogue-free tale, the film explores the inner workings of innocence and exactly how children cope with their given situations. Our protagonist Cuca is an imaginative young boy who goes on a distant, spellbinding journey in search of his father, who appears to have left in search of work. All too often, it can feel like my dad isn't there. Oh yes, he's definitely here. He's in the house, talking periodically, mostly trying to make money to support the family. It's understandably difficult to find free time in a scenario such as this, and he's definitely very supportive. But the opportunities for family bonding seem fewer and farther between nowadays. If he isn't working, it feels like he's busy disciplining one of the two cousins that live with us, as they can be a handful at times. I tend to find more personable comfort in the magic of cinema, so I don't worry too often. But sometimes I feel as if I'm in the way, like I shouldn't be here. I feel like my very presence holds him back from what he needs to do. There's a certain special connection with my dad that I feel has somewhat faded over the years, but it's certainly not lost. I'm not blaming him, mind you, but sometimes I wonder what I can do to get to spend more time with him. I feel as if I'm a nuisance asking him to watch a film with me, despite my best efforts to find some other form of bonding with him. Boy & the World struck a deep chord within me regarding this relationship. I felt like a kid again, trying to retain the attention of my father, in the hope of impressing him in some way or another. I feel like I would do almost anything at this point to capture some more moments with him, after all, I'll only have one father for only so much longer. He's an understandably frustrated and stressed man, and I would do just about anything to see him don a real smile again. It just shocked me how well the director implemented this film's story into the wonderfully creative imagination of this child. The wonderfully wide world of cinema has provided a calm and much needed respite from personal and psychological stresses, and what better way to relieve stress than by letting the imagination roam free? Wonderfully unique and endlessly creative, Boy and the World is a deeply thought provoking meditation disguised as a child's imagination. A simplistic, yet gorgeous canvas of art that never fails to amuse and, at times, amaze. An universal tale meticulously tailored with bare hands and pure heart. The best of social allegoric science fiction, unintentionally adventurous characters from classical silent comedies and the refined aesthetically sense applied to storytelling characteristic of the Ghibli Studio. All that and a highly original style of animation inspired by the romanticized imagination of children. A brilliant sound design, that includes backwards portuguese and a sweet score, completes what is easily one of the past years best unseen feature. PS: If Brasil had chosen this for the Foreign Language race at the Academy it would compete in animation as well? Or for that is required a U.S. release? A beautifully animated Brazilian film about a young boy who goes wanders into the big wide world in search of his father, and discovers individuals along the way who are the victims of industrialization and globalization as modernity crushes all in its wake. The Boy and the World has a simple charm and innocence at its core, and without dialogue sometimes feels like a Jacques Tati film without the slapstick. At this point, it's hard to call something a "surprise Oscar nominee" if it's a GKIDS release and it's in the Best Animated Feature category: Starting with The Secret Of Kells, the company has built a solid record of getting awards recognition for the films it distributes, culled from exceptional animated releases from around the world. This Brazilian film, made for just $400k, is up for an Oscar, which it won't win (not up against Inside Out), but the nomination alone will get it a lot more of the attention it deserves. A dreamy, surreal, but emotionally intense quest story about a very young child looking for the father who left to work in the city, it has pointed political messages about collective action and the destruction of the rain forests, but its wordless, beautiful imagery only comes across as strident a couple of times. Mostly, it's evocative in an intelligent, wistful way. Full review for The Verge here. You can watch the trailer for the film here! To me, it seems as if in recent years, animation has lost the certain finesse that it used to possess. Though I did like films such as Frozen and How To Train Your Dragon, I'm not as captured in emotion by these films as I was of Disney classics such as Cinderella or Sleeping Beauty. It's not often that I feel taken into a new world by animation - the exceptions coming to mind being The Secret World of Arietty and The Book of Life. These may not be my favourite animated films, but when I look back on them, they were able to remove me from my reality, and create an incredible atmosphere. 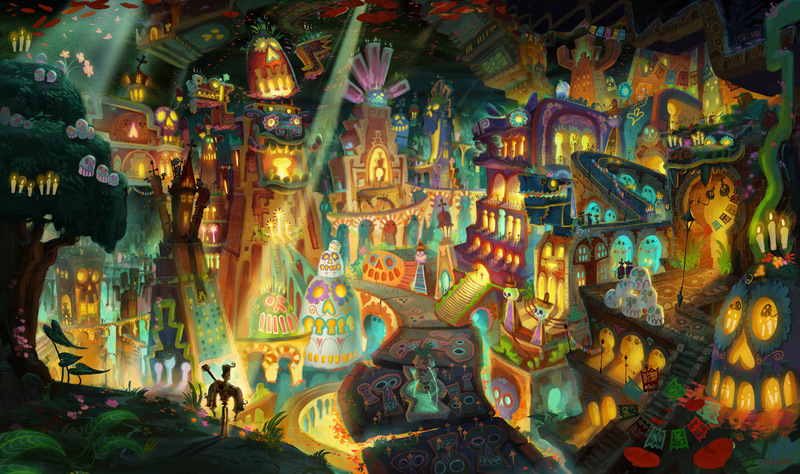 If you haven't seen The Book of Life, you can check out what I mean by looking at this one frame. It's incredible how animators created that world. Same goes with films ranging from Cinderella to Son of the White Mare. So naturally, when the opening shots of The Boy and the World began, I was ecstatic. To me, this film is the perfect usage of the animation. It beautifully uses colours to its advantage, and beyond that, creates a totally unique-looking world, yet they maintain the values of present society so that it's still evocative of the one we live in. And that's the thing I think most modern animated films try too hard to do - to appeal to the masses by creating characters that are just like us. Though doing this is well-intentioned, it takes away from the medium of the film. When I go into an animated film, I'm expecting to be taken away from reality, and put into a fantasy based escape. And that's what The Boy and the World does extremely well. It masterfully removes you reality, and puts you in a world with an individual known solely as The Boy. And from there, we're taken on an extraordinary adventure that can be described simply by the title of the film. This is the story of The Boy and The World. The best part of this film, surely, are the visuals. This is spectacular animation, Ale Abreu is able to create an incredibly vibrant, different world. Abreu obviously has a vision for the outcome of this film - the animation is simplistic, yet it doesn't disappoint. Yes, for the most part, the individuals are drawn quite simply, and the same can be said about most of the sets. But the fascinating thing is that simplicity. It gives the film a genuine look, one that inserts a human-factor behind these characters. It looks genuine because it is genuine - Ale Abreu drew all the drawings by hand. And though the film has a few dialogue scenes, these scenes are spoken in an invented language. Why? To show that these characters can talk, but dialogue isn't necessary to drive the story. What drives the story is the audiences attachment to the young boy, who gradually begins to age. The visuals are enough to indicate to the viewer what's happening in the film - from the moment he picks up his parent's picture to when he has flashbacks of his parents planting a Cherry Blossom tree with him. Everything that happens shows that these characters indeed have human emotions, and that's what keeps audiences interested and intrigued as the film progresses. We see The Boy, we feel The Boy, and we understand The Boy. That's why everything fits together - audiences are met with an individual they can sympathize with, for no other reason than the fact that everybody's been through adversity at some point in their lives. You meet a variety of people on your journey, you enlist the support of your diligence and at the end of the day, you have to accept that you'll win some, and you'll lose some. The Boy and the World isn't a commonly seen film, but it should be. The ideas presented are sound enough for both children and adults alike - the theme of overcoming adversity is one that anyone could get behind. The visuals are among the best animated visuals I've ever seen. And the storyline, though simple, is undeniably captivating as we watch The Boy embark on a lifelong journey to seek out his father, and intentionally or not, discovers himself along the way.